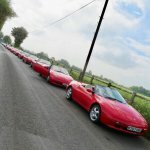 Lotus Elan Central • View topic - Oscar's first car? Ha ha .. be a while before he can use it. Will Grandad use it meanwhile? From the colour I think it's supposed to be the Lotus Type 18 owned by American born Louise Bryden-Brown who liked competing herself but entered Tony Maggs in 1961 F1 Championship races and entered Dan Gurney in non-championship F1 with more success. (Gurney was contracted to Porsche as F1 driver). Cars were pale blue with white stripe and the following year she used the name Anglo-American Racing / Anglo-American Equipe using the Type 18 and a FJ Cooper T59 Special. Her mechanic Hugh Aiden-Jones installed a Climax engine with radiators each side of the engine in side pods in the T59, which allowed a more streamlined nose. Driver Ian Burgess claimed he came up with the idea to put them there - something to do with a radiator pipe passing through the cockpit splitting and scalding his private area.. Car overheated so conventional front rad installed and it took Chapman to implement the idea properly in the Type 72. This grandfather already has. I'll trouser the extra £21994. Halfords are selling these at £40 - a bargain as they are quite nicely made and look great. Brought one for my nephew for Christmas as my two are a bit too old - thankfully they have both become petrolheads and now accompany me on car related activities - although my daughter was disappointed that i didn't buy an Evora to replace the Elan and informed me that a Vauxhall branded lotus is not as cool as the real thing!